My Fourth Great Grand Uncle, Thomas Blanch, was born on the 4th December 1809 in Rolvenden, Kent, England. He died on the 3rd July 1892 at Bulahdelah, NSW, Australia. He was the second child and son of my Fifth Great Grandfather, Edward Blanch (1785-1860) and Fifth Great Grandmother Maria Blanch nee Ashdown (1789-1837). 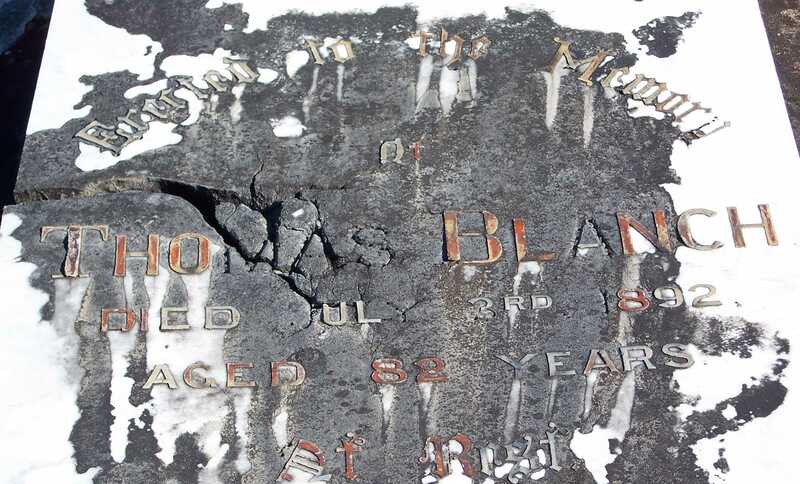 Thomas Blanch was nothing special in vocational terms, being a simple labourer. He was literate and a Calvinist (thereby being a spiritual ancestor of mine so to speak). On the 24th April 1830 in Rolvenden he married Hannah Austin, who was born on the 30th November 1815, Rolvenden. Hannah was the daughter of John Austin and Ann Austin nee Moon. Hannah died on the 8th July 1879 in Newcastle. Together they had 17 children. On the 26th June 1838 the ‘Westminster’ reached Sydney, following a voyage in which Hannah had given birth to a fifth child, David. The previous children were Jane, Thomas, John Thomas and Caroline. Following David would come Joseph, Eliza, Sarah Ann, Harriet, Emma, Amelia, Peter George, Isabella, Emily, Stephen, Mary Ann and Hannah Maria. Thomas was a carpenter, farm labourer and wheelwright. He had been sponsored to come to Australia by J. B. Bettington of Sydney at a salary of 28 pounds per annum. However, it seems he never actually worked for Bettington, rather becoming an employee for George Mosman at his Raymond Terrace property known as ‘Burrowl.’ He was to work on this property for some twenty years. He also worked as a mailman between Raymond Terrace and Dungog. In 1858 Thomas selected a forty five acre parcel of land on the Myall River where Bulahdelah now stands and where I currently live. He built a hotel here known as the ‘Plough Inn.’ The inn was first licensed in 1866. In June 1871 his son Joseph was given the inn. In May 1872 Thomas took up ‘The Forster Hotel’ license at Forster which he owned until 1878. Thomas and Hannah then retired to Newcastle and lived at The Junction. Sadly Hannah died the following year on the 8th July 1879, aged 64. Hannah was buried in the cemetery at the Newcastle Cathedral. Following the death of his wife, Thomas returned to Bulahdelah and on the 24th July 1880, he married Elizabeth Stanborough (nee Morris), who was born in 1835. She was the daughter of Thomas and Mary Morris. Elizabeth died in East Maitland on the 11th August 1889. They had no children together, though Elizabeth had six children to her late husband, Frederick Stanborough (who had died in 1876). Following the death of Elizabeth, Thomas lived for a further three years at Bulahdelah with his son Joseph. On the 3rd July 1892, Thomas died and was buried in the Bulahdelah Cemetery. He was 82 years old. A stained glass window was placed in the Anglican Church in his memory. The Anglican Church at Bulahdelah had been built on land that Thomas had donated. Following the apparently hugely successful World Youth Day, it is a tremendous relief to me to hear the end of the overworked use of the word ‘pilgrims,’ as well as that of the phrase ‘the faithful’ in reference to the many Roman Catholics and hangers on that were in Sydney over the last couple of weeks. I am over it as most can possibly discern. Not a big supporter of the event at all – actually, not a supporter of it to any degree. 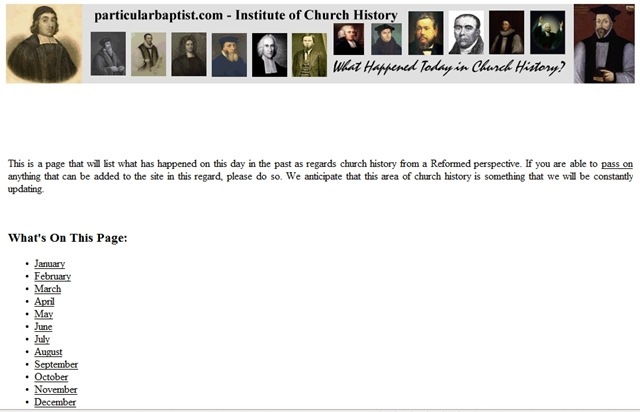 Of course I’m not, I am a Protestant after all and a Reformed one at that. I already have the feeling that a good number of people out there in cyber world are already flexing their fingers as they eagerly prepare to engage this old fashioned Calvinist over his anti-Rome attitude. Before you do though I should warn you that I’m not about to engage in any slanging matches with Papists and their poorly informed attack dogs. This is a Blog after all and I’m allowed to rant and rave and ramble on about pretty much anything should I feel the urge. You have to remember that the forefathers of this heretical crowd used to burn my spiritual forefathers and carry out all manner of other atrocities on Protestants. ‘Oh, but their different now.’ How soon we forget that this mob’s claim is that they never change and given the opportunity this crowd would be only so happy to do the same to me and others like me (Protestants) as they did to the early non-conformist Protestants. I am truly thankful that the Pope has now left these shores and gone back to his superfluous sized home and barns, more than likely satisfied at his recent performance and blinded flocks of sheep that incoherently followed about various pieces of wood and old pictures. An interesting postscript to the recent Catholic activities was what I read today in the newspaper – apparently the brothels are very keen for the event to return to Sydney again. There was a massive increase in earning during the time of the Pope’s visit and the celebrations in Sydney. Strange what ‘pilgrims’ and ‘the faithful’ are into these days.